So, hydrogen for sure, maybe S [III] too. True, but through broadband filters these are all going to be very dim compared with the continuum, which is the source of the overwhelming majority of the energy. Thank you Chris for responding. I can understand and imagine. Thank you for responding. I can understand and imagine. Seeing such an image would be very interesting. 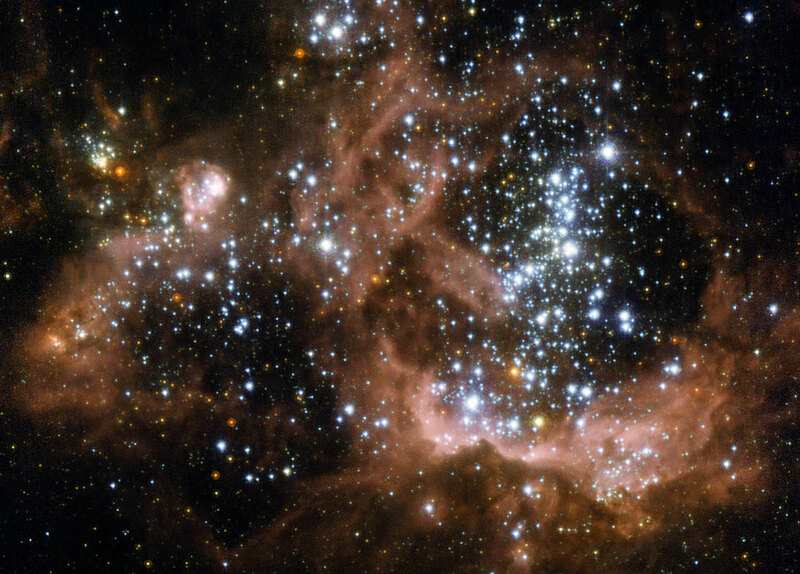 NGC 604. ESA/Hubble and NASA. You are absolutely right that the 814 nm filter would not detect cool gas. The ESA/Hubble and NASA picture at right shows that there are indeed cool (orange-looking) stars inside NGC 604 that emit a lot of infrared light, so you are also right about the fact that the infrared filter used for the Hubble picture of M33 must have detected starlight from cool stars. However, given that the infrared filter detected infrared light from cool stars inside NGC 604, I must assume that the blue filter used for the Hubble picture of M33 did not just detect OIII from the ionized nebula of NGC 604, but also blue starlight from the large numbers of hot stars inside this giant site of star formation. Honestly just find the four filter version a little more interesting. The F814W filter works differently enough from "red" that it doesn't really look all that much like RGB. The dust is just that much more transparent to it. I could probably mix it down and make it look a lot closer to RGB, though, and then force some saturation back into it just like a "natural" color image that people crave. It still won't have pink hydrogen clouds, though. F814W just isn't right for that.